In the Great Depression of the 1930s, magazines had to make serious cuts in their size and price in order to stay in business. At the same time, there was increased demand for inexpensive entertainment as people continued to take interest in popular culture in the form of movies and recorded music, but couldn’t always afford it. Literacy rates were also at an all-time high. These factors produced a boom in light, frivolous fiction, often poorly printed on rougher, more acidic paper (“pulp”) than the glossier paper (“slick”) used by established quality magazines. 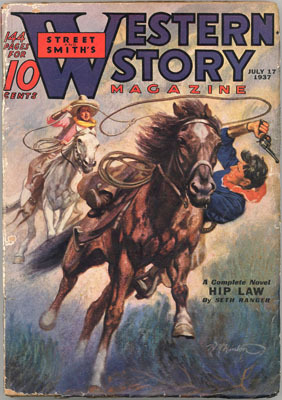 Unlike the slicks, pulps were relatively easy for unknown artists and authors to be published in -- and they paid accordingly less. This fact, in addition to the often lurid subject matter some pulp titles specialized in, led some illustrators and writers to use pen names or not to sign their work at all. Walter Haskell Hinton, however, was as proud to contribute to pulps as he was to slicks, and he seems to have signed most if not all of what he did for them. Unsurprisingly, his pulp covers and interior illustrations occasionally show more hasty draftsmanship than his work for sporting and outdoors magazines. 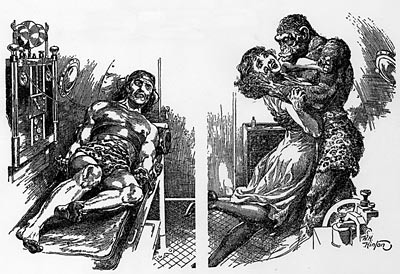 Hinton did work for several pulp magazines but seems to have steered clear of the truly violent and sexually explicit ones. 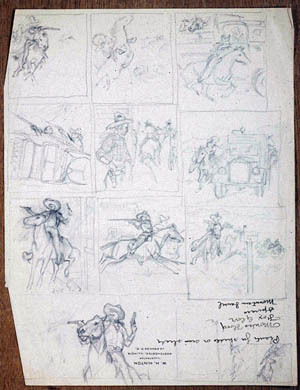 Instead, he concentrated on the Western and historical subjects -- with the occasional foray into science fiction for titles that were art directed by William Hamling, who usually bought artwork from Hinton for Mammoth Western. 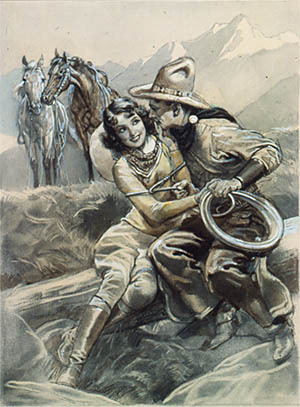 In the body of Hinton's work, it is difficult to say where pulp images end and serious Western art takes over. Because he liked Western subjects so well, many of his illustrations destined for cheap publications were as good as his better-paying work. 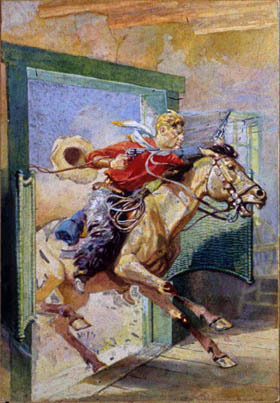 They only differ in that they are highly dramatized and concentrate on the traditional climactic moments of popular Western literature: saloon shoot-‘em-ups, death-defying tumbles down cliffs, hell-bent horseback rides, and the like. Often, Hinton’s comprehensive renderings preserve more liveliness than his finished works, which tend to be very tightly rendered in keeping with the more precise, slick styles that gained in popularity in the 1930s. 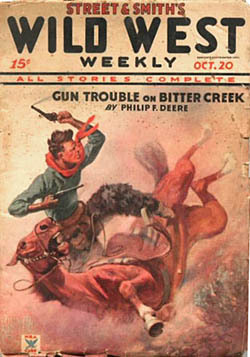 To appreciate this shift, one can compare the Western and pulp paintings to the farm magazine covers of the 1920s, which are softer and more Impressionist in the handling. 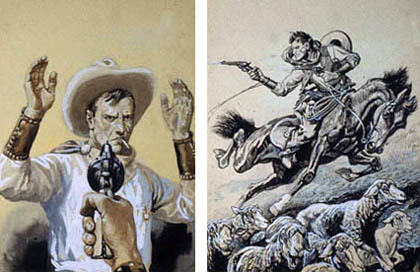 Comprehensive renderings in gouache (left), and ink with gouache (right). 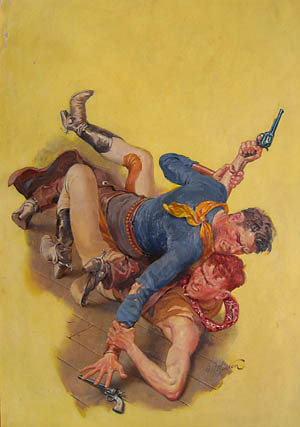 Original oil on canvas; publication unknown. 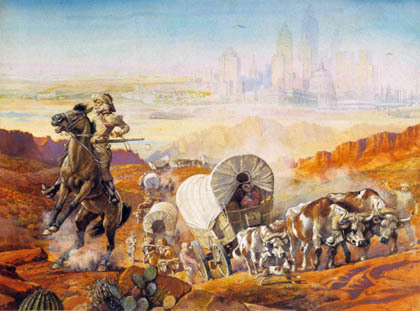 Hinton’s more serious Western paintings are properly history paintings. Although these often feature elements calculated for popular taste such as pretty ladies and heroic celebrations of progress, they show considerable research and planning as well as careful execution. In this picture probably destined for art prints or puzzles, time is compressed as a pioneer wagon train heads out away from a futuristic city complete with airships. Original watercolour. 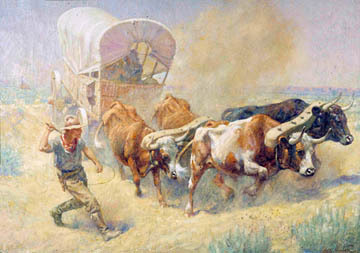 Walter Haskell Hinton's admiration for iconic Western artist Frederic Remington shines through in this oil on canvas. 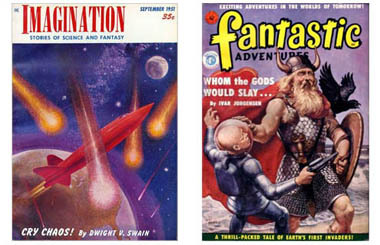 Thank you to David Saunders, Robert Weinberg and many others for information on pulps. For further research, David's Field Guide to Wild American Pulp Artists is very useful.